Tourist foreign exchange inflows are expected to lag behind, in growth terms, the growth rate of tourist arrivals in the country this year, a report by the Institute for Tourist Research and Forecasts (ITEP) said on Tuesday. The report said tourist foreign exchange revenues were not expected to match a forecast of a 8-10 percent growth rate in tourist arrivals in Greece this year, but would record a growth rate of at least 6.0 percent for the year. ITEP said tourist foreign exchange inflows recovered strongly in June, while he noted that tourist arrivals in August -with the exception of Corfu- exceeded forecasts and led to a forecast for a growth rate of 8-10 pct in 2006. Tourist arrivals in Crete and the Dodecanese rose 10.6 pct and 12.1 pct respectively, in the period January-August 2006, compared with growth rates of 6.3 pct and 1.4 pct in the corresponding period in 2005. 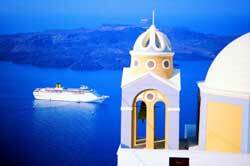 Northern Aegean islands also recorded strong growth, exceeding 10 percent in the first eight months of the year. Cyclades islands also recorded strong growth in tourist arrivals, while Ionian islands lagged behind with the exception of Cephalonia (up 16 pct this year after a drop of 10 percent in the same period last year). The report noted that Greek tourism growth was more than double compared with other competitors in the European Mediterranean region (Spain +5.3 pct, Turkey -2.2 pct and Portugal +5.5 pct). Another report says foreign tourist arrivals in Greece rose by 8.3 percent in 2005 over the preceding year 2004, according to figures released Wednesday by Greece's national statistics service (ESYE) regarding the previous year’s numbers. According to the ESYE figures, arrivals from Europe, which account for 93 percent of the tourist market, rose by 6.5 percent in 2005, with the largest proportion (19 percent) coming from the UK, followed by Germany (15.7 percent), and Italy (7.9 percent). A substantial increase was also recorded in arrivals from Romania (51.5 percent), Bulgaria (36.3 percent) and Russia (28.1 percent). With respect to a breakdown of data concerning travel means and point of entry, the airports with the highest rate of traffic in 2005 were Athens' Eleftherios Venizelos International Airport (AIA), with 24.1 percent, followed by Irakleio Airport (Crete) with 12.8 percent; Rhodes with 7.8 percent and Corfu with 5.6 percent. In a comparison with 2004, the airports with the largest increase in traffic in 2005 were Mykonos (14.8 percent) and Santorini (10.5 percent), while declines in arrivals were recorded at the airports of Kavala (25.6 percent), Rhodes (77.8 percent) and Patras (Araxos) (49.3 percent). A 2.6-percent increase was also recorded in passenger arrivals on charter flights in 2005 as opposed to 2004.